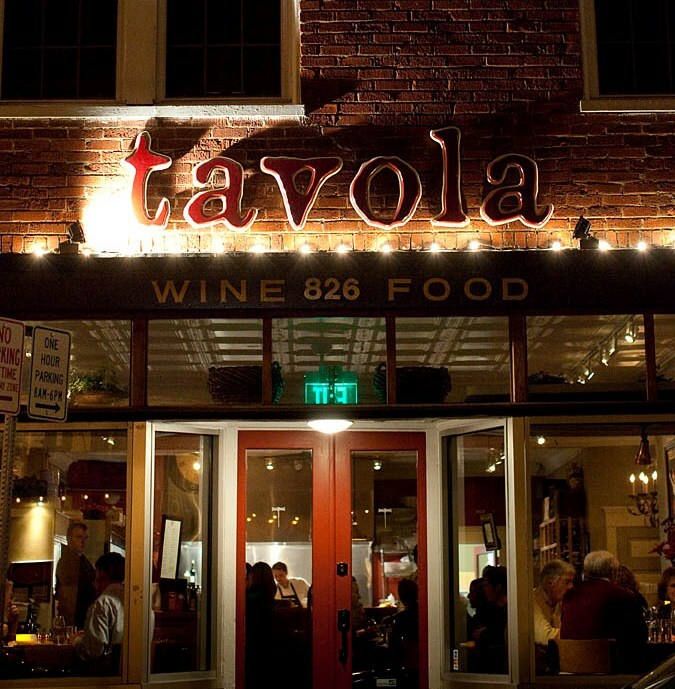 Tavola may be Charlottesville’s warmest restaurant. It’s not just the cozy vibe of the 37-seat wood-floored storefront that makes it feel so warm. It’s also the affable servers who seem sincerely to care about each customer’s experience. And, most of all, it’s the soulful, rustic Italian fare that tastes as though it is made by people who love what they are doing. Courtesy of Beyond the Flavor. Keaveny started cooking Italian food so early in life that it is practically in his blood. He grew up in Hartford, CT in a house just around the corner from the family that owns the legendary Italian restaurant Carbone’s. It was “kind of a given,” Keaveny recalls, that he would work at Carbone’s as soon as he was old enough. But, Keaveny would soon learn that it is a tough industry. Following a similar career path to that of so many aspiring chefs, Keaveny went from one restaurant to the next, always learning and looking to advance his career. At 28, he attended the Culinary Institute of America, considered by many to be the nation’s best culinary school. Next was a stint as head chef at Oakville Grocery, in Napa Valley, which lasted until the store decided to scale back its prepared food service. From there, Keaveny took a job as head chef at a country club south of San Francisco. And, finally, he returned east to Painter’s Restaurant on Long Island, NY, where, as head chef, he revamped the menu and quickly earned critical acclaim and a new cadre of regular customers. It was in 2004, while chef at Painter’s, that Keaveny realized he was at a crossroads. He and Tami had just had their first child, and knew that the transient life of a rising chef would not be well-suited to raising a family. It was time to find somewhere to settle down and grow some roots. The only question was where. Keaveny’s short list of possibilities included nothing but New England towns. Raised in New England, he saw himself settling down there. But, Tami urged Keaveny to consider a city several hundred miles to the South, which she had fallen in love with one summer years earlier: Charlottesville, Virginia. Tami was sufficiently persuasive that, in February 2004, they took a trip to Charlottesville to see if Keaveny could envision building a life there. They spent their visit doing typical Charlottesville things. They stayed at the Omni Hotel. They pushed their young son Jack in a stroller down the downtown mall. They ate at Mas, Blue Light, and Fleurie. Keaveny was sold. “It’s a great place to raise kids,” he concluded. And, Tami of course agreed. Soon after arriving in Charlottesville, Keaveny took a job as Director of Restaurant Operations for Red Light Management, Coran Capshaw’s company that runs several of Charlottesville’s most popular restaurants. Compared to the life of a chef, the job had its advantages. It had a schedule that allowed Keaveny time with his family, and it also helped him to develop a good sense of what works in Charlottesville restaurants and, perhaps more importantly, what doesn’t. But, Keaveny eventually found that the job’s frustrations outweighed its advantages. He was trying to inject his passion into many restaurants instead of just one, which, he realized, doesn’t work. So, Keaveny began searching for opportunities to do what he had always wanted to do: open his own place. In early 2009, he identified what he thought was going to be the site of his restaurant. He reached a “gentleman’s agreement” with the owner of a restaurant off the downtown mall who was looking to sell. With the agreement in hand, on a cold Monday morning in the winter of 2009, he met with Red Light Management to part ways. He went straight from that meeting to the site of his new restaurant. But, to Keaveny’s surprise, the owner had gotten cold feet and backed out of the deal. Keaveny could hardly believe it. He had left his job and had even developed a business plan on the understanding that this would be the site of his new restaurant. Shaken, he decided to grab some lunch and a bottle of wine to “regroup.” He went to Belmont Barbecue to pick up a sandwich and walked down the block to what was then Crush, a Belmont wine shop. Crush was closed that day, so Keaveny peaked in the window, and immediately thought it would be an ideal space for a restaurant. He even imagined the location of the kitchen, bar, and tables. “I’ll be right there,” he said. Keaveny’s initial plan for the restaurant was to showcase his favorite creations over the years, regardless of cuisine. With so many favorites — Vietnamese, Italian, and American Regional to name a few — Keaveny was reluctant to limit himself to just one. Keaveny calls Tavola’s cuisine “philosophically Italian,” by which he means that he wants his guests to eat the way Italians eat. This manifests itself in several ways. One is moderate portion size. At some Italian-American restaurants, Keaveny observes, diners receive a bowl of pasta “as big as a laundry basket,” smothered in tons of red sauce. Italians don’t eat like that, says Keaveny. Rather, they eat moderate portions that allow sampling several dishes in one meal. Relatedly, Keaveny’s food is geographically based. Guests sometimes ask Keaveny which region of Italy his menu features. Tuscany? Apulia? Keaveny’s answer is always the same. “Virginia.” Keaveny aims to cook food that he imagines Italians would eat if Virginia were in Italy: dishes created from the area’s best seasonal ingredients. It is Virginian Italian cuisine. Of course, for some ingredients he is willing to make exceptions. When he can get it, he flies in from Italy some of the best burrata in the world. 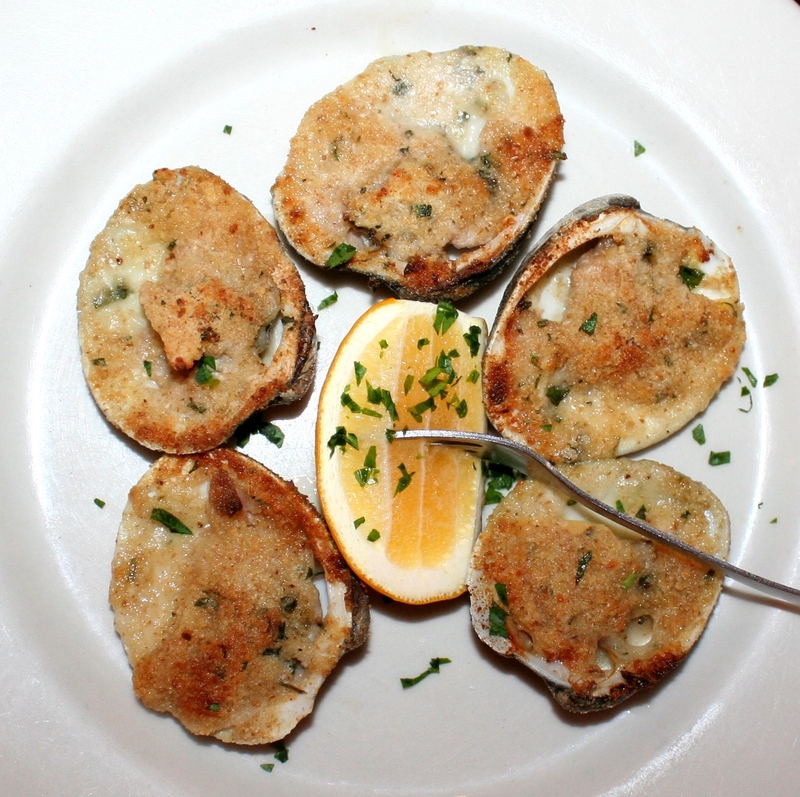 And, his clams come from Narragansett Bay, which he likewise considers the best in the world. With these principles in mind, Keaveny has created a seasonally changing menu of his own recipes that draw on his life’s work, inspired by his decades of experience – from Carbone’s to Charlottesville. The menu is divided into six sections: anitpasti (appetizers), zuppe e insalate (soup and salad), paste (pasta), entrate (entrees), contorni (sides), and dolci (dessert). Appetizers range from $8-$10, pastas from $17-$21, and entrees from $17-$25. Daily blackboard specials, often stellar, add to the options. Roughly half of the wine list’s 90 bottles are Italian. While in California, Keaveny drank primarily the New World style wines that are prominent there. Since then, his tastes have shifted towards Old World style wines. That shift is reflected in Tavola’s wine list, although lovers of New World wines will also find a few selections for their palates. When asked, Tavola’s servers are nearly always spot on in suggesting wines that complement food choices. Keaveny wants his servers to be knowledgeable and enthusiastic about Tavola’s food and wine, but he will not stand for the pretension that he says too often goes along with a restaurant’s wine program. 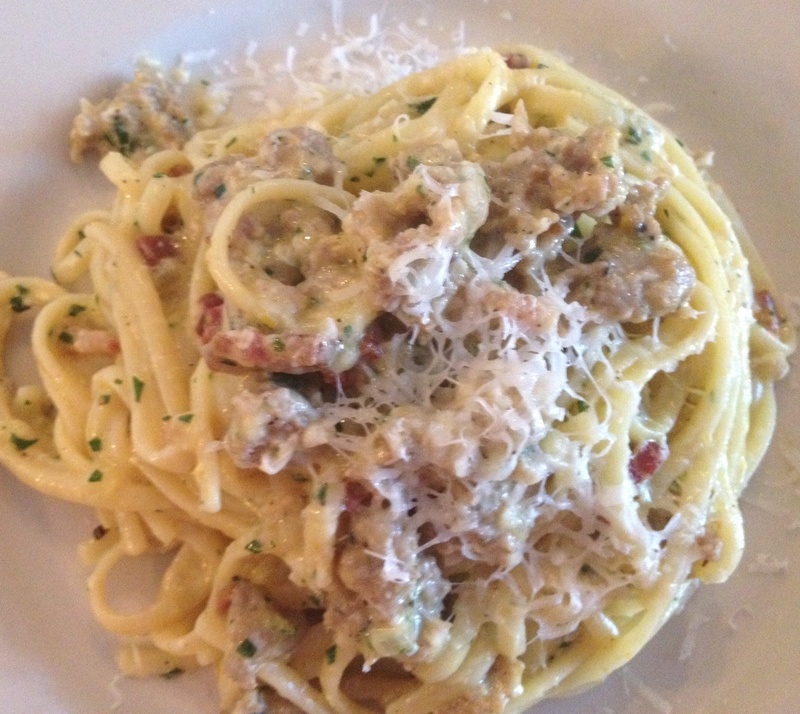 Flaws are so rare at Tavola that it is a struggle to suggest any improvements. If pushed to nitpick, we would note that the restaurant’s defining characteristic – warmth – can actually be a problem at times. Tavola’s kitchen and dining tables are all in the same room, separated by just a bar. This makes for great theater and intimacy. Yet, on summer nights, the heat from the open kitchen and the muggy central Virginia air can conspire to make the room warmer than would be ideal. Ordinarily, we might beat the heat with a refreshing pre-dinner cocktail, but at Tavola that’s not possible because of the one other thing we would change: the absence of liquor. This is all the more conspicuous because of the recent renaissance of Italian spirits and cocktails in American bars. A Negroni or a Little Giusseppe would be an ideal way to cool down before a Tavola meal. On the other hand, this may be a case of “be careful what you wish for.” The decision not to serve liquor at Tavola is one that the Keavenys consciously made, and it may be for the better. Keaveny wants his restaurant to remain food-centric, and does not want to attract a crowd of drinkers to the bar at the expense of customers who come for his food. In any event, neither of these improvements is remotely necessary. Even without them, we will return again and again. And, in making Tavola a regular haunt, we are far from alone. 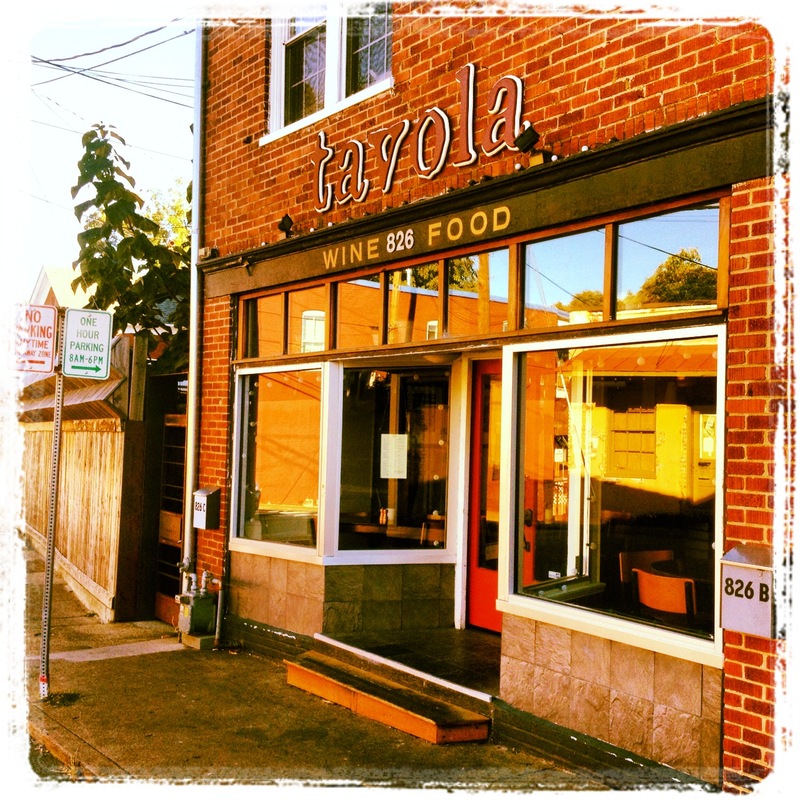 When Tavola opened its doors in July 2009, word quickly spread about Keaveny’s outstanding food. Three years later, Tavola has grown so popular that on most weekend nights it feeds roughly 150 diners, which Keaveny says is the maximum number feasible in a single night at Tavola. 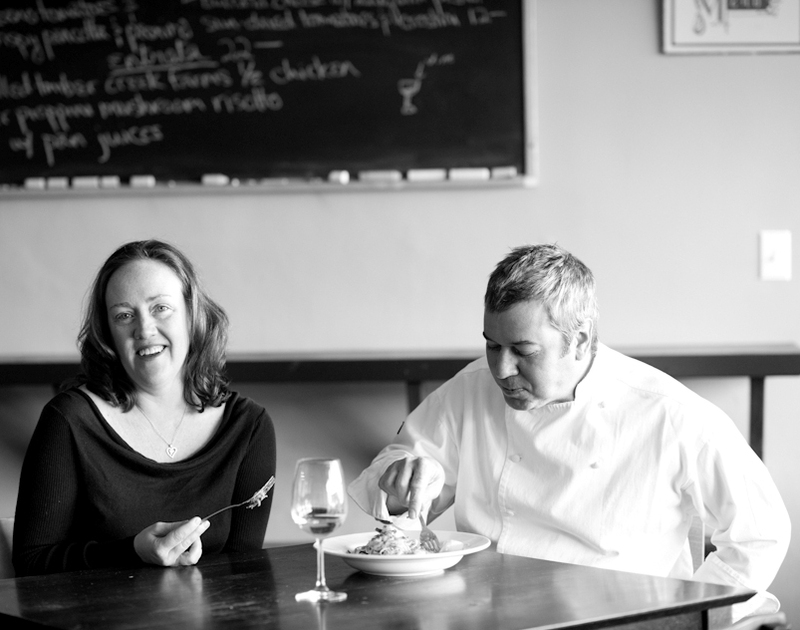 Inspired by their love for each other, for Charlottesville, and for food, the Keavenys have created one of Charlottesville’s most beloved restaurants. We are suckers for ingredient-driven food where the chef gets out of the way. With thirty years in the restaurant business, Keaveny has honed the restraint and skill necessary to pull it off. There is not a dud on the menu. Yet, while the regular menu items are excellent, it is the specials that can reach even greater heights. Below are our picks as well as Keaveny’s.